Buffer Cylinder Assembly The NGL buffer cylinder (fig. 5-17) is located in the deck housing between the approach track and the aft slide-access track. The buffer-cylinder body has integral guide tracks on its top surface and contains three hydraulic cylinders. The two outer cylinders contain hollow piston rods; the center cylinder piston rod is solid. 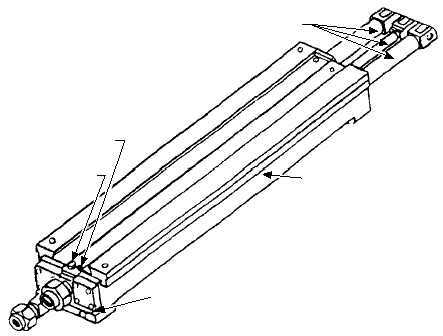 The forward end of each piston rod is attached to the slide assembly. Within each outer piston rod is an orifice tube, which meters fluid flow through the outer cylinders to absorb the forward energy of the aircraft during the buffering stroke. Prior to aircraft holdback bar/buffer hook engagement, the buffer cylinder assembly is in the standby cycle (fig. 5-18) with the three piston rods fully retracted into the buffer cylinders. While in the standby cycle, hydraulic fluid is constantly circulated between the hydraulic system and the buffer cylinder assembly through two metering orifice screws at a rate of approximately 8.5 gpm. This metered flow, which is nonadjustable, is to maintain the hydraulic fluid in the system at the proper temperature. When the aircraft holdback bar engages the buffer hook, the slide assembly moves forward, pulling the three piston rods from the cylinders. As the piston rods move forward, fluid in front of each outer-cylinder piston is forced through the holes around the periphery of each outer-cylinder piston and through the metering holes in the two orifice tubes. As the pistons continue forward, the number of metering holes in the orifice tubes is progressively reduced, causing an increasing resistance to forward motion of the slide assembly, thus decelerating and bringing the aircraft to a smooth stop at the end of the buffing stroke. During the buffing stroke, fluid in front of the center-cylinder piston is forced through a port in the cylinder and through the hydraulic line into the NGL valve-manifold accumulator, which acts as a cushion and fluid reservoir. After launch, the fluid pressure established by the valve-manifold reducing valve acting on the forward side of the center cylinder forces the center piston aft, thus retracting the three rods into the cylinders. Buffer Accumulator Assembly The buffer accumulator assembly (fig. 5-19) is located below deck in line with and aft of the buffer cylinder assembly. The buffer accumulator consists of a hydraulic accumulator mounted in a support with a tee fitting and associated hardware. During operation, as the buffer cylinder piston rods are pulled forward, hydraulic fluid flows from the accumulator, through the tee fitting and associated piping into the aft end of the buffer cylinder assembly filling the void created as the piston rods move forward. After the launch, the buffer piston rods retract into the buffer cylinder forcing fluid from the buffer cylinder back to the accumulator. Fluid continues to flow into the accumulator until the pressure buildup exceeds the spring-load of the check valve located 5-18 BLEEDER PLUG METER SCREW BODY METER SCREW PISTON RODS ABEf0517 Figure 5-17.Buffer cylinder assembly.